Nokia today announced a new C series smartphones Nokia C6 at a press event in Finland. Nokia C6 is placed just above the first Cseries phone Nokia C5, which is expected to hit markets by Q2 of 2010. The Nokia C6 has a design and specs very similar to Nokia 5800 and few other Symbian touch phones. The notable change in Nokia C6 is the availability of a QWERTY keypad and enhanced social media connectivity. Nokia C6 low price smartphone based on Symbian S60 V5 platform. Therefore it will run all applications crafted for the latest Nokia touch series, available at Ovi store. The innovative home screen design of Nokia C6 let users to access contacts, update social websites, email, important apps in just few clicks. Nokia C6 is a quad band GSM and 3G mobile phone with high speed HSPDA connectivity. The device has 3.2 inch TFT touch screen nHD (	360 x 640 pixels) resolution and 16 million colors support. Watching videos and surfing web is pure pleasure in this screen which also sports an accelerometer senor for UI auto-rotation. Moreover the home screen of the C6 screen is customizable with widgets, contacts and apps. Nokia C6 includes 200 MB internal memory which is upgradable to 16GB visa micro SD card slot. It was little bit difficult to type on the touch screen of Nokia5800 Xpress music, 5530 and 5230. 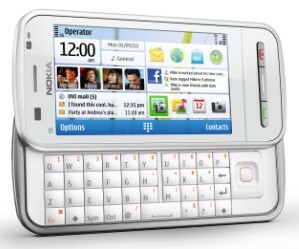 Since the Nokia C6 designed as social phone, users can enjoy the full QWERTY experience without making much mistakes. As you can see from photos, Nokia C6 home screen several apps to keep up to date family and friends. The Facebook and email widgets in Nokia C6 pushes updates and messages in real-time. Nokia C6 has inbuilt apps to access multiple instant messaging and email services. There is an option to customize home screen with favorites contacts and their photos. Facebook updates, email, SMS and all other recent activities of contacts are accessible from corresponding entries in phone book. The device includes two cameras, one 5 MP autofocus main and secondary VGA camera for video calls. Free Nokia Ovi maps with life time license and inbuilt GPS receiver helps in navigation and real-time location updates in social profiles. Other features of Nokia C6 includes WLAN, GPRS, EDGE, full web browser, Micro USB port, 3.5 mm headphone jack, FM radio with RDS, Bluetooth with A2DP etc. Nokia C6 social smartphone, Nokia battery BL-4j 1200mAh, connectivity cable, headset, Charger and 2GB card. Nokia will launch Nokia C6 in the second quarter of 2010. The expected market price of Nokia C6 is 220 Euro in Europe, which when converted to rupees is around 1400o in India. can we hack a mobile. how many types of hacking for a mobile are there. i wish nokia c6 will b soon in chandigarh stores …. im very exited to buy it on my birthday. Nokia is the best mobile phone seller brand in all over world. 5 mega pixel Auto Focus with LED flash camera is used in this phone. it got 200 MB internal memory with microSD card support up to 16 GB.Its sound quality is very good. this is the most outstanding set in the world………………… as i know. is nokia c6 available in assam today? I am searching for a 3G nokia phone with wi-fi it’s price at least Rs.8000, plzzzzzzzzz reply me……….